Brenna,my new foster dog arrived today! Brenna is a 5 year old smooth coat shortie jrt who arrived today! Her legs look a little longer than a shortie. She is available for adoption thru russellrescue.com By the way, every dog I ever dogsat or fostered has a pic taken with their tongue on their nose. Here is Brenna touching her nose after she ate a slice of cheese. Comments for Brenna,my new foster dog arrived today! Brenna is an alpha female and you can not put two females together.She would do better in a home as an only dog. 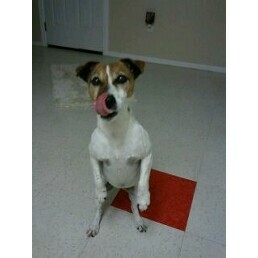 But here is a newly posted ad for a jrt that needs out of the shelter. Does anyone have a place in their heart and home for Tazmaine? Contact Kathy at russellrescuesoca@gmail.com if you can foster or would like to adopt Tazmaine. She doesn't deserve to die alone in a shelter! She is beautiful.Can you please tell me about her does she have any aggressive actions?Does she do well with other Jacks?What is her name and where are you located?Im thinking about getting another I currently own 2 JRT,s and would love to get another but some females are not too good!I live in Sarasota florida. What a sweet picture. I love how her tongue is caught in action. I have many similar of my Jack. I hope she finds a home soon! Thank you for calling my attention to Russellrescue.com. What a great website. I'm not quite ready for another Jack but if I am in the future I will definitely use your site. It's also nice that there is a donation area. I am teaching my children about charity and we are always looking for new causes. Since they adore our Jack, this would be perfect. Thanks.